Pottstown, Pa.—Montgomery County Community College will host a “Meet the Artists” reception for the “Visions” art exhibition on Sunday, June 1, 1-3 p.m. at the Fine Arts Gallery, North Hall, 16 High Street, Pottstown. The exhibition features the artwork of four area artists: Phil Smith of Schwenksville, Jim Hendricks of Pottstown, Julie Longacre of Barto, and Sonya Moyer of Earl Township. The exhibit opened May 12 and will continue through June 6. Both the exhibition and reception are free and open to the public. Longacre’s Dairy will serve homemade-style ice cream at the reception. Everyone is welcome. “Entitled ‘Visions’ this exhibition reflects how each of us, with our own separate working styles and mediums, has been united by the common idea of strong personal visual expressions,” says Phil Smith. Phil Smith: Metal sculpture by Phil Smith, Norristown. As a metal sculptor, Smith likes to create sculptures as visual recordings of his life and how his life has been involved with these things. 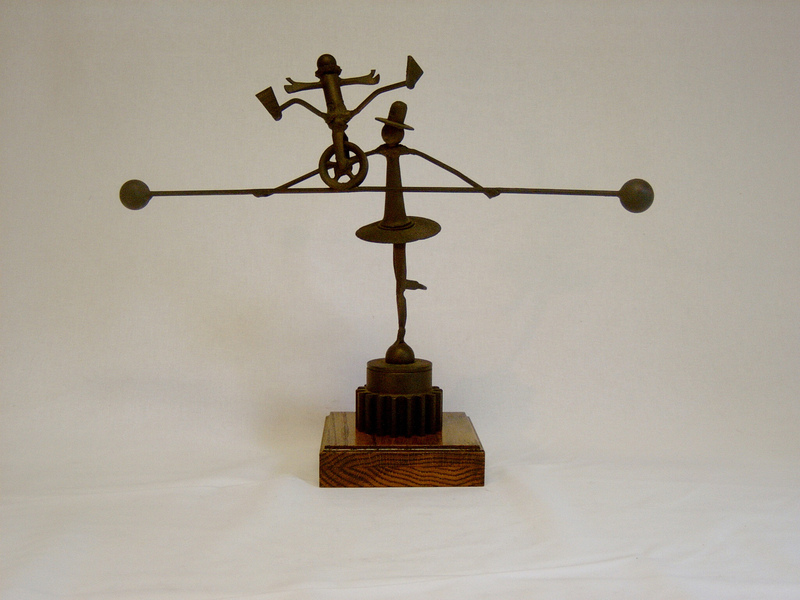 His sculptures incorporate weathered, used objects, such as old tools, machine parts and discarded metal objects. “The sculptures are nearly all the assembly of the brazed and welded metal parts coming together to express an idea based on my perception(s) of life,” he notes in his artist statement. Smith, now retired, taught Fine Arts in the Norristown Area High School for 33.5 years, and his sculptures have appeared in numerous local galleries and exhibitions. He earned a bachelor’s degree and Master of Science degree in Education from Millersville University and a second master’s degree in education from Marywood College in Scranton. Additionally, he has taken courses at Temple University/Tyler School of Art, the Pennsylvania Academy of Fine Arts, as well as other area arts centers, and has an associate’s degree in Art from Montgomery County Community College. Stone/wood sculptor Jim Hendricks is a former student of Smith’s at Norristown Area High School in 1978-1980. The two sculptors have maintained their friendship throughout the years and are looking forward to exhibiting their work together at the gallery. Jim Hendricks: Stone sculpture by Jim Hendricks, Pottstown. 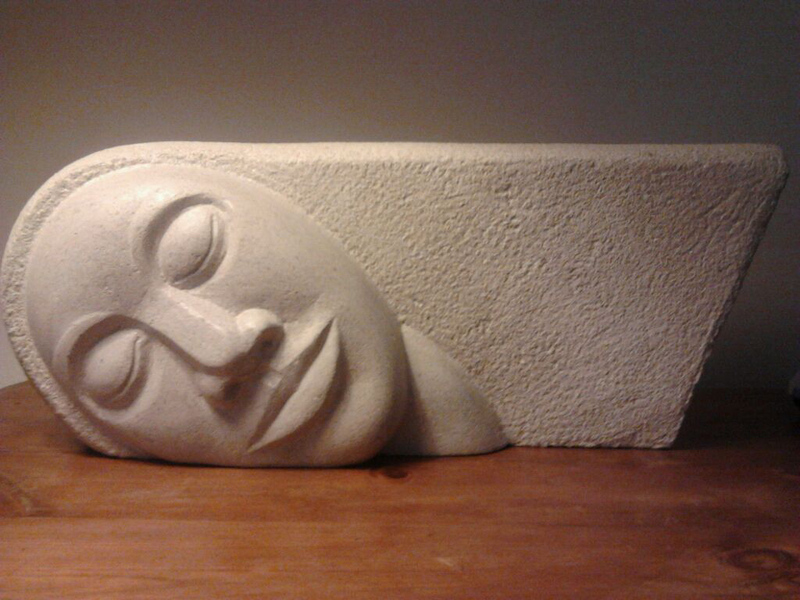 Hendricks has always been inspired by the human form and his work is influenced by a range of work from the German expressionists to Aztec and Mayan carving and from the American realists of the Works Progress Administration to the Medieval and Gothic carvers, according to his artist statement. “I believe that by exaggerating, enlarging, stretching and distorting the forms of the human figure, I can express powerful emotions and ideas to the viewer through the sculpture,” he says. A native of Norristown, Hendricks graduated from the University of the Arts in 1984 and helped to fabricate sculptures for the Treehouse exhibit at the Philadelphia Zoo. He then worked as a studio assistant on government-commissioned monuments in Washington, D.C. He currently has a studio in Pottstown. Like Smith and Hendricks, artists and sisters Julie Longacre and Sonya Moyer look forward to sharing gallery space at the Fine Arts Center, too. Julia Longacre, a Berks County native, earned her Bachelor of Fine Arts degree at Bethany College, Lindsborg, Kansas. 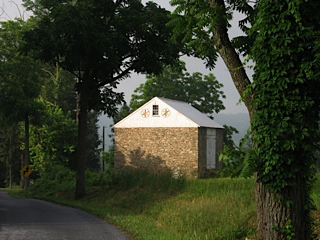 She first exhibited her local landscape paintings in 1971 at the Boyertown Historical Society, launching her successful career in fine art. Throughout her career, Longacre has held numerous solo exhibitions locally, regionally and as far as Nova Scotia, Canada, and garnered many awards and accolades. 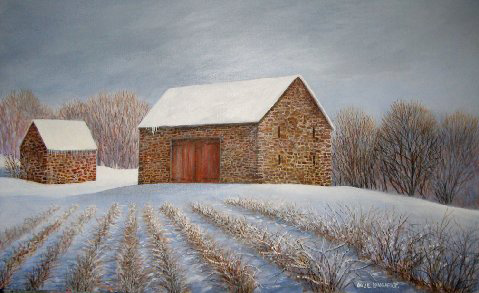 Julie Longacre: “Rows into Winter” by Julie Longacre, Barto. Proficient in any medium, from watercolor, oil or acrylic, Longacre is well-known for her landscapes and buildings of the rural countryside of southeastern Pennsylvania. Her love of painting and joy of writing has been an integral part of Berks County community for the last 40-plus years. Artist/photographer Moyer lives in an 1838 restored stone farmhouse, where she enjoys capturing the bucolic landscape and “workings” of the farm through her camera lens. She credits her sister for encouraging her to exhibit her photographs and to truly “see” and appreciate the world around her. “I try to capture the joy and wonder, the quietness and beauty of nature, a small frame of perfection in an imperfect world. So many times, these little scenes are just fleeting moments and are gone before you fully appreciate them. Sometimes it just takes my breath away, that I am lucky enough to see and experience these moments and I want to share it with others so that they, too, can see, feel, enjoy and reflect on them,” says Moyer. The gallery is open Monday through Thursday, 8 a.m.-9:30 p.m. and Friday, 8:30 a.m.-4:30 p.m.
Sonya Moyer: Photography by Sonya Moyer, Earl Township. For more information about the exhibition, contact Montgomery County Community College Galleries Director Holly Cairns at 215-619-7349 or hcairns@mc3.edu. For information and photographs of exhibitions and participating artists, friend us on Facebook/DestinationArts.